Today, since it’s our 100th interview of a millionaire here at ESI Money, we have a special guest for you. Let’s see if you recognize him. I’m 54 years old, my wife is 57, and we’ve been married for 27 years. Two children. A son and a daughter. My son lives at home and works full-time. My daughter is set to graduate college in December. We live in the great state of Colorado! I track my finances on Quicken (and have for over 20 years) and record net worth at the end of each month. The numbers above are for the month ending October 2018. The retirement accounts are a combination of 401k rollovers — one my wife had when she worked (over 25 years ago) and several from my employers over the years. There’s also a SEP IRA from business earnings through the years. The rental real estate is likely worth a few hundred thousand dollars more than listed, but since there’s no way to tell that for sure other than selling, I’ve left them in at cost. More on this later. The taxable (non-IRA) account is used primarily to fund our Donor Advised Fund, which is how we do our giving these days. Cash has been accumulating as 1) we liquidate the peer-to-peer loans and 2) live on less than what we make. I need to decide where to deploy it…more on that later. This number includes some money in an HSA as well. I depreciated the value of our home to where it equals cost less realtor’s fees (if we were to sell). In actuality, the house (less realtor fees) is probably worth much more than what’s listed as our market has been very hot the past two years. But again we’d need to sell to realize it, so you never know for sure. More on this later too. The 529’s are monies we have in those accounts, though we have some withdrawals to make before the end of the year. The car/silver/website number is a combination of miscellaneous assets. The number for the website I purchased last winter, has been “depreciated” in my accounts so I feel more comfortable with it on my balance sheet (I have taken part of my earnings and used them to offset the loss in value). Based on what the site earns, it’s likely worth double what’s in Quicken. More on this below. The Donor Advised Fund numbers represent what I have given to the DAF (and thus written off my taxes) but not yet distributed. At this level I have a couple years or so of prepaid giving “expenses” set aside here. When the amounts are distributed, I deduct them from Quicken and list it as an expense. As noted above, I am in the process of liquidating my peer-to-peer loans and should have them all completed by sometime next year. The credit card charges are what we owe at the present (we just paid for another trip to Grand Cayman). We pay these off every month. The large liability numbers represent what we “owe” our kids in college costs. Our daughter graduates in December and will be paid her remaining balance as per our agreement and our son is yet to decide if he’ll attend college or not. When I retired in August 2016, our net worth was $3.34 million. By the end of that year it was $3.43 million. By the end of 2017 it was $3.83 million thanks to the stock market. Our peak was $4.01 million in August of this year — before the market corrected. This said, all these numbers could be higher and likely are in reality. I am a conservative bookkeeper and our financial numbers reflect this. It’s a trait that’s served me well and old habits die hard. My rental units have been estimated (by my management company who wanted to sell them for me if I wanted to do so) to be worth about $400k more than the cost of them listed above. My websites (the one I just bought plus the other two I own) are likely worth about $150k more than what I have in Quicken. Our primary residence is likely undervalued by at least $50k even with realtor and moving fees deducted. If we had/wanted to sell, our cars are worth at least $25k more than I have recorded. When you add these up, that’s an extra $625k in assets with no additional liabilities. I don’t have a formal job as I retired two years ago. My wife does work part-time at our church as a first grade teacher. I run three websites and own rental properties for income. It’s hard to tell what the sites will generate this year as they are growing quickly, but my best guess currently is about $120k before taxes. I’ve had some extra expenses on the real estate side, so my best guess this year is $45k. $10k in dividends from our taxable account. These are reinvested, but they are considered income for tax purposes. $8k in interest. Sitting on lots of cash. $6k from my wife’s job. Add those up and you get to $189k. I started out of graduate school (MBA) in 1988 making $40k per year (which seemed like a fortune for me at the time). I joined a top-notch Fortune 50 consumer packaged goods company and from there my marketing career was born. Over the years, I learned how to grow my career income by focusing on seven key steps. I learned these mostly by trial and error. As one job started to level out, I would move to another one, either within the company or at a new company. As a result we’ve lived all over the U.S. though most of our time (14 years) was spent in Michigan. I eventually rose to become the president of a $100 million company with 800 employees. After delivering record sales and the 4th best profit year in company history, I was fired from that job less than two years after taking it. The job turned out to be a dud but I had found a place I loved to live so we retired here. From an income progression standpoint, I was making $100k by the time I was 31 (I remember because I was shooting for it by 30), made over $200k for the last 10-15 years of my career, and peaked one year at a bit over $300k. Over-perform — Set quantifiable expectations with your boss in writing, then do better than the goals. Be likeable — In some cases likability counts more than performance. Much of it boils down to simply being a nice person. Network — A strong network can help you in so many ways. Be attractive — You don’t have to be Brad Pitt or Kate Upton (which I am really thankful for! ), but at least cover the basics. Continual learning and growing — Especially skills that lead to higher pay. Manage yourself — You need a way to get things done to maximize your effectiveness. Market yourself — Those who know how to write a resume and interview well can cash in on better jobs from time to time. Do these and you’ll be able to earn several percentage points above average (my salary grew 8.16% per year for 28 years) which will earn you millions more than others. If you don’t believe me, run the numbers yourself. Early in my career I worked like a fiend — long hours and weekends to boot. It was stressful and tiring, but I wanted to build a career and grow my income, which I did. Thankfully, I found a company that paid me the most I’d ever made and only required me to work 40 hours a week with little travel and no weekend work. It was a blessing as it helped our family life immensely and hit just as the kids were growing up. I was either at or a part of (as a coach, etc.) almost every single activity the kids did while they were growing up. By the time I became president of the company, it was all full-speed-ahead again — the most stressful job I’d ever had. The kids were grown by then and had their friends so it wasn’t such an issue for them, though it was for my wife. The job on Colorado was “fine” as a balance, but I disliked my boss and I realized I only had one more year with my daughter before she went to college. So I retired and work life balance has been great since. Not sure what I’ll do with my cash. I could pick up an extra business or two (and hire someone to run it for me — maybe my son or daughter) or buy some more rental properties if the markets ever become more reasonable. I also could invest the cash into index funds. According to Quicken our spending the past 12 months has been $138,405. But that’s a bit misleading. The biggest expense by far has been college costs for our daughter which amounted to $52k. But almost all these dollars are reimbursed to us from the 529s. Given that, our “real” spending is about $86k the past 12 months. Of that, $12k was on travel and $13k was on a car for our son (we paid half). Without travel I think our “normal” spending would be in the $70k range and if need be we could get it down to $50k in a pinch. As noted above, we went to Grand Cayman this year — taking our entire family plus my parents. Taxes are paid quarterly and I’ll probably owe more this year when we file. Utilities includes all the standards (electricity, gas, water) plus cell phones and cable/internet. The medical costs include our monthly payment to Samaritan Ministries (it’s not a premium but you could call it that), a couple large dental bills from our kids (having cavities — they are now paying for their own dental work from here on out), and my regular dermatologist visits. The home repair number is almost entirely the cost of a whole house fan we had installed in August. It made the end-of-summer nights much more enjoyable. Entertainment is mostly our gym membership ($159/month). It’s a high-end gym (closer to a spa) so it feels right listing it as entertainment. Missing is big gifts since those come from the DAF. But we do give extra directly in cash, as noted. The “all other” is mostly an accounting issue and not real spending (maybe $3k of it is real). We take money from our son’s paychecks and set it aside for him. Then when he uses the money it seems like our spending, though it really isn’t. If you want more insight into our spending see here and here. We do at the present time and have since just before we went into retirement. I created it in excel and update it monthly. Our history with budgets is on again, off again. We had a budget for the first 5-10 years of our marriage, but after we became so good at controlling our expenses, I stopped doing them for 15 years or so. I started again in retirement because I thought we may need to tighten things down a bit, but apparently I was mistaken. We saved an average of 36.1% of our gross income over the 20 years I reviewed in Quicken. Here is our savings rate by year. As I’ve noted, giving took 26.0% of gross income and taxes took 21.0%. Travel. We have taken three cruises and went to Grand Cayman earlier this year. I hope to get to the Caribbean at least once a year for the rest of my life. I also travel a lot in the U.S. This year I have been to California, Washington, D.C. (twice), Virginia (three times by year’s end), and Orlando. Of course we live in a tourist town, so we get a lot of visitors, which adds to our “vacation” time. It has changed through the years. For most of my working life it was to invest as much as I could into low-cost index funds and allow them to grow. Then about five years ago as I was looking to generate more income (in preparation for retirement), I started buying rental properties. At this point I’m living off income from those properties and my websites and simply allowing our investments to grow on their own. By amount, the index funds. By what it did in my life (provided income that finally got me to retire), the rental properties. Marrying my wife. She can squeeze a quarter out of a penny. Getting an MBA. It kicked off my career with a bang and allowed all the saving/investing we did. Ugh. The real estate partnership with my former boss and friends. Probably over 8%, but I use 8% in all my estimates. Every few days or so I update it in Quicken as I’m adding expenses. There were several here and there but none too terrible as we had a huge cushion between what we earned and saved. We were able to avoid major problems like many other millionaires. Nothing really. Our investments are simply growing on their own and I’m looking for a place to invest the cash we are generating. No major shifts since then. Start saving earlier — It took me five years out of college to get my act together. Retire much earlier — I was FI 10+ years ago and should have made the jump. I plan to work on my websites into the foreseeable future and may buy a couple more (and have others run them). I plan to get to the Caribbean at least once a year. The rest will depend on what our kids do and where they live. I’m living them right now! Most people say healthcare, but I’ve been more than pleased with our solution. I don’t really have any issues at this time, just interested to see where the kids land and what we do as a result of that. When I got married my wife and I started helping others with their finances (mostly budgeting) at our church. We took training prior to helping and the training not only equipped us to help others but also taught us a ton about managing our own money. When we started to counsel others we learned a great deal about real-world money issues. We could see first-hand what was working and what wasn’t. Much of our learning was from others’ mistakes. and started applying the concepts there. It was the single-most influential money book of my life. I eventually began to write about money (magazines and blogs). As I wrote I learned more about what it really took to become wealthy. Writing forced me to decide what I really believed and encouraged me to take action. It was during this time that I would probably classify myself as “financially literate”. The authors of these five money books. Yes. Through my working years we gave away 26% of our gross income as noted above. Currently we are moving our brokerage investments into a donor advised fund (thus avoiding capital gains taxes) and giving from it. We give roughly $30k-$40k per year. Yes, we are just in the process of updating our wills as a matter of fact. Honestly, the question that I was most interested in was the last one – how much you give in retirement. Glad you answered that! Using a DAF in retirement seems to make a lot of sense to offset your capital gains and allow your money to grow. Glad to see you make giving a priority, though I am not surprised after meeting you in person. You walk the walk, which is a great thing. It’s super helpful having those “passive” income streams come in through the websites and rental properties. By the looks of it, you are almost financially independent just through those vehicles. You may not even need to touch your nest egg for a while, which is a great situation to be in. Glad that you interviewed yourself for the 100th interview! Now, I am looking forward to the one where you combine the statistics from all of the interviews that you have done since the first. Yes, those are coming! It will take me a bit to get them all compiled, but I plan on several posts highlighting what we’ve learned from the first 100 millionaires. MANY THANKS for the first hundred! Very excited about the upcomming posts that analyzes these interviews. Great interview ESI! I think I knew most of it already from reading your site for a while, but nice to see it all pulled together. What a great financial situation you have created for yourself and your family. Passive income is the best! This was a fun read. While I knew almost all of it, it’s still interesting to read it all in one place. Congrats on all your accomplishments and thanks for all the giving you do – financially and otherwise. I have really enjoyed this Blog Series and it is great that you took the opportunity to get your own thoughts down in this format as well. Congrats on doing a fantastic job for your family. Really amazing work for a long period of time. The importance of consistency is something that I feel we overlook in the FIRE community but it is invaluable in reaching our goals. Its Mr ESI himself , correct? ESI, you have such a wonderful story and I loved reading it! Thank you for what you have put together on this website, especially the millionaire interviews. Your sites have really helped me and I know many others at optimizing our financial game! Curious…do you think you have had more of an impact on others in your roles prior to retirement or now with the websites/blog? Thank you for “interviewing” yourself. It was a fun Monday morning read. This post would have been great if it did not have so many links. It reads a bit like an advertisement for the author’s blog. Just kidding of course. Having pieced together so much of your story already it’s great to read it all in one place. I find it encouraging to see how much your wealth has grown since you hit the first million. It’s weird to find role models on the internet but you’ve certainly become one for me. Congratulations on your success. I’m very impressed with your giving amounts and hope to emulate that in my life as well. Keep up the great work with the blog, it’s one of my “must reads”! Like others have commented, it was nice to have your whole picture pulled into one piece. Wonderful to see your nest egg continue to grow even after retirement! – there is still a good amount in the 529 and you mention your son is undecided about college. What are the plans for those funds if he decides not to pursue further education? How many years will you let it sit before making the decision to use the funds otherwise? -I have read up on the DAF and understand the tax savings benefit, but also see there are fees associated with maintaining this type of account. Trying to wrap my head around the advantage of going the DAF route vs. outright transferring appreciated securities to a charity each year? We make several large donations ($5-20k/charity) a year and have the brokerage transfer stocks to the charity. No fees, we maintain the asset until it’s donated and get the same tax benefit. Is it so you can give smaller donation amounts? Great series, can’t wait to see the summary and appreciate that I’ve been able to participate as well! Our current plan is to let them sit, grow for 20 years, then pass them to grandkids if we have any. Second, I have tried the direct-to-charity transfer and it’s a HASSLE (at least the few times I did it it was). Charities aren’t generally equipped to accept gifts this way (except for the largest ones). In addition, I may want to “give” this year (and get the tax advantage) and then distribute funds in latter years. This way I can load up giving I want to do over a two year period and get the tax break whereas I may or may not give over the standard deduction if I split them up. You can use that 529 money if you happen to see a qualifed University offering classes in Rome, or London and you want to hang in Europe for a semester. The American University has branches in Europe that qualify as being about to use 529 money. Thanks for sharing your story. It helps to keep us young people motivated. Thank you for the breakdown and all the details! I also found The Millionaire Next Door to be a very influential book and I recommend it all the time. Besides this website, can I ask what other websites you’re working on? I also post every other week on my first site that I started in 2005. I have not revealed that site’s name as I don’t want them tied together, but many long-time readers are aware of what it is. Thank you for this “interview.” As a fairly new follower, it’s a good way to see what has worked for you, in addition to the other interviews. Your site has been an inspiration and catalyst in my life. When the student is ready – the teacher appears. I just paid off my student loans (18 years after graduating) and we have about 6 months left on my spouse’s. Then we’ll be “back to broke”. However, this process has lead us to develop a lifestyle over the last 5 years where we save between 30-40% of our income. Reading your site has helped me see what I need to do once we get this debt paid off and how to think about life moving forward. I’m as excited as I’ve ever been. I am a first generation college grad, now I want to be the first millionaire. Awesome! You are well on your way! Thanks for sharing, ESI! I’ve pored over the site enough that it all seemed very familiar. I love knowing what $1 million at 42 turned into just a decade later. Your millionaire series has had a profound impact on me over the past year. Congratulations on reaching 100 and THANK YOU for making it possible for the rest of us to learn from each other. It is one of the best bulls markets in the last 10 years, so tread conservatively. Absolutely. Certainly not a good idea to assume the next ten years will look like the last. It was fun to see the links to various articles you’ve written over the years and how they tie in to your overall story. To your question about what to do with your extra cash, I’ve been struggling with that as well. I recently sold some real estate that had appreciated enough that it just didn’t make sense to rent it out anymore. I am trying to diversify into conservative private equity real estate that generate cash flow from Day 1 – value add or funds that do B/C midwest apartments that generate good cash flow regardless of economic conditions. One thing I recently discovered that you could look into is life settlement funds (they buy life insurance policies with the intent of continuing to pay the premiums until they can collect the death benefit). Generally stable returns and completely uncorrelated to the stock market. The main risk is cash flow as they have to keep paying premiums and you don’t get any return until the death benefit is paid out. Loved the 100th interview and the series as a whole. It’s allowed me to get perspective and find a community of like minded people with regards to money and personal finance. I have lots of questions in my head but I’ll keep it to the most important in my opinion. 1.When you were working on getting to the first million, how did you deal with the feeling of not getting there fast enough. I sometimes get impatient and anxious about the whole thing. (I’m halfway there, and by my calculations should reach there by age 40). I know I’m out of balance in the sense that I look at this to much and it’s always on my mind (reaching 1 mil by 40). At least market fluctuations don’t bother me, or I’d be really screwed ? 2. How did you with the “guilt” (if any) when buying expensive toys. Real life example, I would like to buy a $4,000 MacBook pro 2018. However I don’t need it, but want it. I want it but at the same time think saving and investing it would be the responsible and prudent thing to do. I know on the surface it’s not a hard question but I struggle with it. I cover my expenses, about 12k including some minor household items that they let me pay for. How do I enjoy some of my money along the way without the guilt, while continuing accumulating wealth? 3. How did you give to charity during your working years? I tend to give whatever strikes my mood. Some years it can be 5k or just the baselibe 1k. I would like to just starting doing that a bit more regularly and automaticly just like most of my investing. Alot of my problems are first world problems; even with my health issues I’ve been blessed to born into the right family to deal with it all and help me get to a place where I can handle it financially on my own eventually. ESI, you remind me alot of my folks especially how you’ve assisted your kids. You have no idea how much that helps set them up. That’s gonna quite the legacy one day! I’m curious to get some feedback these questions have been on my mind for a while and you can’t bring it up around most people. 1. I don’t remember even really having a goal to become a millionaire. I wanted to grow my wealth, knew I was taking the right steps, and was happy with that. When I got to $1 million it was kind of fun — for about five minutes. Then I forgot about it and simply kept up the basics. If I had to do it today, I would focus more on a number but it would be my FI number. I would try to balance saving for it as much as I can while also enjoying life…which leads us to question #2. 2. First of all, we were generally frugal, so we saved a good amount. You do too. That said, it doesn’t mean we live a Spartan lifestyle and don’t like to spend on things we enjoy. You have to live your life as well and have a few splurges on the way to FI. Our splurges were new cars (we always bought new, not used) as well as trips once the kids got older (we began taking mid-winter cruises to the Caribbean to break up the 5-month Michigan winter). 3. We budgeted for our giving. We started at 10% and then bumped it up a percent or two each year until we got to the level we wanted. There were some special years where we went even higher for a cause we really loved, and the big gap between what we made and what we spent allowed us to do that. I hope these are helpful answers. if I didn’t quite hit anything right (or misunderstood the meanings of the questions), let me know and I’ll try to clarify. I know and agree with you but i’m bad at letting go and splurging on myself. Appreciate the insight on your giving I’d like to think about this part of my plans and formulate my own way. looking forward to the next 100 interviews. Update on my purchasing delema, I was cleaning it up so I could give it to a family member if I decided to pull the trigger on a new one, well the machine crashed due to my idiocy with computers. Guess that’s a sign of some sort. Here’s hoping the people at the apple store can fix it but I’ll be getting that new machine 7 years- a good run. I’m getting a new computer myself this year. Decisions, decisions. This is my favorite blog. Thank you for all of your content! Nice surprise for the 100th! I actually knew it was you just by looking at the picture at the top of the post. 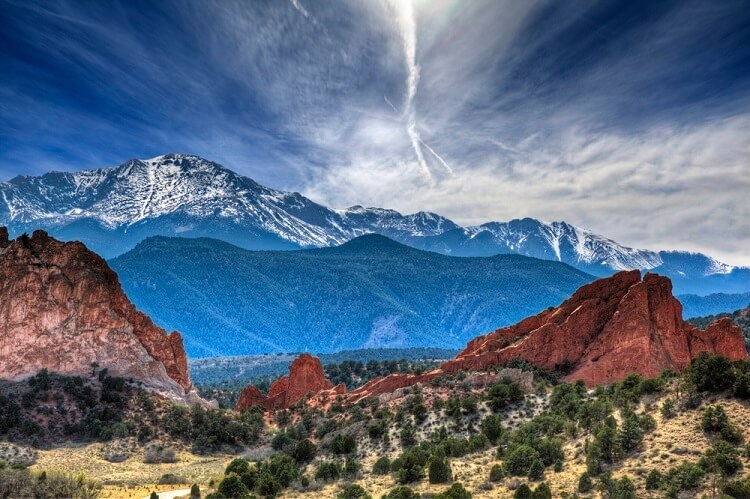 Looking forward to climb Pikes Peak with you as there it is looking majestic! A very comprehensive post and you keep the reader wanting more with the last paragraph. As I was reading it….I thought…this guy’s story is similar to ESI. He must be friends with ESI. Then I noted – even ESI gor fired by his boss. And why is this guy linking to all the ESI posts? Of course, with all the comments, it was apparent. Great job. I am still waiting on the meetups idea…. I knew there was a reason i liked your site! So many parallels, in particular the Quicken and index fund piece. Good read. All common sense. Great interview! While I realize the probability of this request being granted is near infinitesimal, I request being your 1000th ESI millionaire interview. ? I wonder if we’ll get there…who knows? Haha, excellent interview, ESI! That’s for sharing some further insights into your finances. You’re rocking it and helping a lot of people along the way. How in the world are you 54!? You look like 40 at best. Great seeing you at Fincon this year. Haha! Great seeing you too! This is my favorite quote “Marrying my wife. She can squeeze a quarter out of a penny.” I know you often feature the millionaire men on ESI, (because they are the ones that volunteer and answer your questions), but I love how this focuses the attention on what the two of you have built together! Kudos! I’ve often said that I was great at offense (making money) and she was great at defense (saving money). It’s a very good combination! OK I admit it. It took me about four links into the interview to connect the dots to the identity of the interviewee….. I re-read your posts about your healthcare experience and decision. Glad that the health sharing is working for you. Hope you are on the road to a good recovery. I am doing well, thanks. I’ll have an update the day after Thanksgiving when I have a “chat” post going up. Great job on this interview! I realized the parallels when you mentioned you live in the great state of Colorado … “What a coincidence…” LOL … I knew it was you by the second link on liquidating the peer-to-peer loans. I must admit I’m catching up on about the last 6 interviews since we moved. Needless to say, It has been quite busy and an enjoyable a ride. I knew most of the details but I learned a few more things about you and your family. Many blessings, and keep sharing this much needed information. PS. I have sent at least 2 dozen people to your blog. I hope they take advantage of the information within. Thanks, appreciate that. Glad to hear things are settling down! With regard to investing, one thing I am looking to do is setup a couple of short term rentals in areas I wish to visit regularly. I plan to let a full service vacation rental management company (Vacasa) run the rentals with the goal of approx. $30k return per property. I’ll start with one and see how it goes then take it from there. I’m wondering about that myself. Could be a solution for the cash issue. Cool interview, ESI! I didn’t realize it was you until I read through the comments. Just went back and re-read this. Great job and thanks for sharing. When I get the urge to spend money I come here and it helps ground me! I am thinking just a few more years and I will “retire” very early.